The Weimar Republic began the year 1924 by discontinuing the Germania and Hyper-inflationary period definitive postage stamp designs, reminiscent of imperial times and of unspeakable economic hardships. The seven new definitive postage stamps shown above (Mi. #355-61, Sc. #330-36) were issued between March and November of 1924. Each of these simple designs depicts a modernistic looking German Eagle. These, as well as almost all the remaining stamp issues of the republic, are perforated 14 x 14-1/2 on network watermarked paper. The 3 Pf., 5 Pf., and 10 Pf. stamps exist with both upright and sideways watermarks. The upright watermarks are the more common of the two. The 5 Pf. and 10 Pf. denominations were produced in panes, coils, and booklets. The two booklet panes, containing 10 stamps, are very expensive. The 3 Pf., 20 Pf., and 30 Pf. denominations were produced in panes and in coils. The 40 Pf. and 50 Pf. denominations were only printed in panes of 100 stamps. 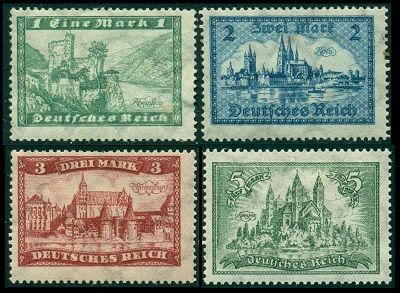 The 1 Mark denomination Weimar Republic definitive pictorial stamp, shown above (Mi. #364, Sc. #337), was issued on upright watermarked paper in 1924, and later, in 1927, it was issued on horizontal watermarked paper. The stamp pictures Berg Rheinstein Castle, with the Rhine River below. Rheinstein Castle was built in about 1316. It was abandoned after about 1344, and from the 14th to the 17th Centuries, it was under the ownership of the Archbishops of Mainz and subsequently under various feudal lords. It eventually fell into ruin. In 1823, the castle was purchased by Prince Frederick of Prussia, who had it completely rebuilt. It became the favorite residence of Prince Frederick, and in 1842, one of the castle's first state guests was Britain's Queen Victoria. The 2 Mark denomination definitive pictorial stamp, shown above (Mi. #365, Sc. #338), was issued in May 1924. The stamp depicts a drawing of the Old City of Cologne. Cologne was founded in 38 B.C. by the Romans as Colonia Claudia Ara Agrippinensium. During the Holy Roman Empire, Cologne became a free-city of the Hanseatic League, and its archbishop was one of the seven prince-electors. Because of its location on the Rhine, Cologne has always been a major commercial and shipping center. The 3 Mark denomination definitive pictorial stamp, shown above (Mi. #366, Sc. #339), was issued in June 1924. The stamp depicts Marienburg Castle, located in Western Prussia until 1945. The fortress of Marienburg was built by the Teutonic Order of Knights, and it was completed in 1406. The Order named it Marienburg (Mary's Castle), and the town of Marienburg eventually grew-up around it. After World War II, this area became part of Poland, and today, the castle and the town are called Marbork. The fortress was destroyed during World War II, and during a fire in 1959. The Polish government began restoration in 1962, and today, the fortress has been mostly restored, though the cathedral portion is still in ruins. The 5 Mark denomination definitive pictorial stamp, shown above (Mi. #367, Sc. #350), was issued in September 1925. The stamp depicts Speyer Cathedral. There have been recorded settlements on the site of the Area of Speyer, dating back 5,000 years. The Speyer Cathedral, officially the Imperial Cathedral Basilica of the Assumption and St Stephen, is the seat of the Bishop of Speyer and part of the Archdiocese of Bamberg. Pope Pius XI raised Speyer Cathedral to the rank of a Basilica in 1925. Construction was begun in 1030, and today the Cathedral of Speyer is considered one of the finest of all Romanesque monuments. The stamps shown above (Mi. #385-97, Sc. 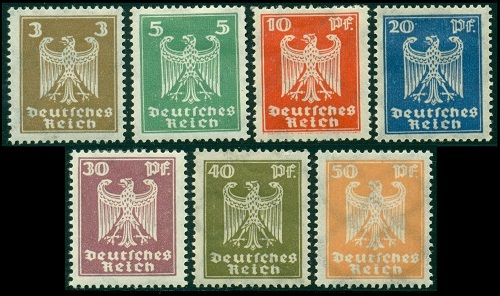 #351-62) were issued in the Weimar Republic between November 1926 and August 1927. These new designs feature portraits of Famous Germans, with some of them being repeated throughout the set. During this period, the 3 Pf. and 5 Pf. denominations were issued in two distinctly different shades. 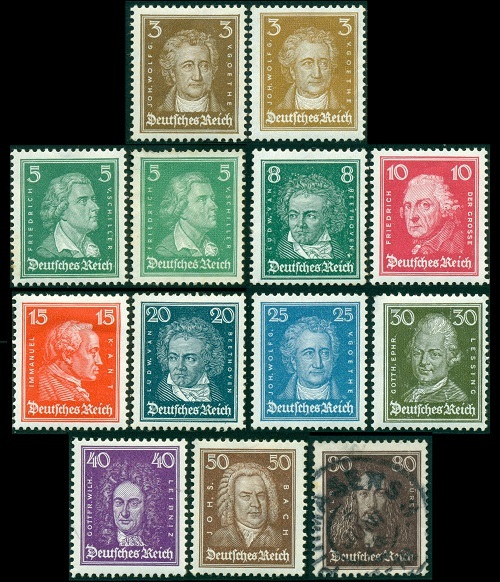 All of these Weimar Republic definitive postage stamps were issued both in panes of 100 and in coil rolls. The 5 Pf., 8 Pf., 10 Pf., and 15 Pf. denominations were also issued in booklets, having panes of 10 stamps for each denomination. A very rare variety of the 20 Pf. is known with a sideways watermark.